Tempera on board, 51.4 cm x 51.4 cm, according to the Quinn sale catalogue  but the reproduction in New Age (see below) is not square. This drawing was published in the New Age in 1914 with an analysis by T. E. Hulme: 'This drawing contains four figures. I could point out the position of these figures in more detail, but I think such detailed indication misleading. No artist can create abstract form spontaneously; it is always generated, or, at least, suggested, by the consideration of some outside concrete shapes. But such shapes are only interesting if you want to explain the psychology of the process of composition in the artist's mind. The interest of the drawing itself depends on the forms it contains. The fact that such forms were suggested by human figures is of no importance.' Roberts challenges this final sentence in his introduction to Some Early Abstract and Cubist Work (1957), where he states, 'In an abstract design the concrete forms upon which it is based have greater importance than Hulme allows for . 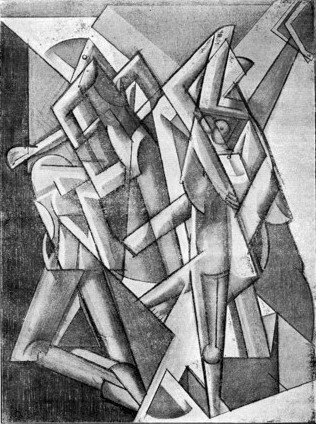 . . ' This drawing was probably exhibited at the Vorticist exhibition at the Doré Galleries in 1915 as Drawing. It is one of four works selected by Ezra Pound in London for John Quinn, the American art collector, and transported to New York in 1916 and exhibited in the Vorticist exhibition at the Penguin Club in New York in 1917. It was purchased by John Quinn for £6 at the time of the exhibition, and became part of his collection. John Quinn died in 1924, and his collection was sold in 1927 (Viviene Greene, 'Ezra Pound and John Quinn: The Penguin Club Exhibition 1917', in The Vorticists (London: Tate, 2011)).